Following comments Wednesday from CFPB Director Kathy Kraninger, the bureau has officially announced its symposia series "exploring consumer protections in today's dynamic financial services marketplace." The first symposium will be focused on clarifying "abusive" under unfair, deceptive or abusive acts or practices (UDAAP). The Consumer Financial Protection Bureau will unveil new debt collection rules in a few weeks, the agency’s director said Wednesday, potentially unleashing a battle over the industry’s tactics and consumers’ rights. The proposal, which would be the first update to the Federal Debt Collection Practices Act in more than 40 years, will address how often debt collectors can call someone and the industry’s use of emails or text messages, said CFPB Director Kathy Kraninger. The CFPB will “modernize the legal regime for debt collection,” Kraninger said in her first major speech since becoming the bureau’s director in December. 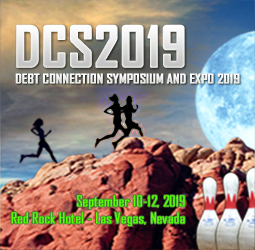 Washington, D.C. — Consumer Financial Protection Bureau Director Kathleen L. Kraninger announced a symposia series exploring consumer protections in today’s dynamic financial services marketplace. The series is aimed at stimulating a proactive and transparent dialogue to assist the Bureau in its policy development process, including possible future rulemakings. During each symposium, the Bureau will host a discussion panel of experts with a variety of viewpoints on the topic. A symposia series planned in the coming year by the Consumer Financial Protection Bureau (CFPB) will focus on topics related to the bureau’s mission, beginning with a look at clarifying the meaning of “abusive acts or practices” under Section 1031 of the bureau’s enabling statute, the 2010 Dodd-Frank Wall Street Reform and Consumer Protection Act (Dodd-Frank), agency Director Kathleen Kraninger said in a speech Wednesday. A law restricting payday lending in Ohio that was co-sponsored by a Springfield representative is about to take effect. House Bill 123 was passed and signed into law last year. Rep. Kyle Koehler, R-Springfield, and co-sponsor Rep. Michael Ashford, D-Toledo, introduced the bill to close loopholes and clarify statutes regulating the payday lending industry, including the Short-Term Loan Act, to ensure payday lenders are operating under intended guidelines.The law, which goes into effect April 27, prohibits borrowers from owing more than $2,500 in outstanding principal at a time from multiple payday lenders while continuing to protect them from unscrupulous lending practices. The law limits monthly maintenance fees to either 10 percent of the principal or $30, whichever is less, and caps the overall fees for a loan at 60 percent of the principal, according to a news release from Koehler’s office. In her first public speech as director of the Consumer Financial Protection Bureau, Kathy Kraninger said the agency would focus on supervising and working with financial institutions on protecting consumers, rather than enforcing laws against them. Kraninger announced Wednesday that the CFPB would soon propose rules to update one of the nation’s older consumer protection statutes, which prohibits abusive practices from debt collectors. One proposal would be a clear limit on the number of phone calls per week debt collectors could make. Thank you to our hosts for the invitation, and to all of you for coming today. I’m particularly honored to be at a forum focused on bringing people together from across the political spectrum to forge commonsense solutions for the pressing issues facing our Nation. That’s the approach I am taking to advance consumer protection and mature the Bureau to meet that mission. I want to specifically thank Jason Grumet, President of the Bipartisan Policy Center as well as BPC staff Shai Akabas, and John Soroushian. BPC has supported dialogue on myriad issues, including the CFPB mission. 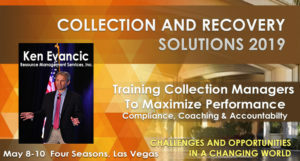 discuss training methodology for maximizing collection performance – with Compliance, Coaching and Accountability. U.S. government debt prices rose on Wednesday as the Federal Reserve said the economic activity grew at a slight-to-moderate pace in March and early April. The Fed’s Beige Book report, a region-by-region assessment of the U.S. economy based on anecdotal information collected by the 12 regional Fed banks, found that the U.S. economy continues to grow and labor markets remains tight across the country. Microsoft Office products are today's top target for hackers, according to attack and exploitation data gathered by Kaspersky Lab. 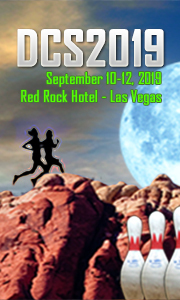 In a presentation at its security conference --the Security Analyst Summit-- the company said that around 70 percent of the attacks its products have detected in Q4 2018 are trying to abuse a Microsoft Office vulnerability. That's more than four times the percentage the company was seeing two years before, in Q4 2016, when Office vulnerabilities had accounted for a meager 16 percent. The federal government is best at protecting consumer data and the health care sector is the worst, according to a new study by the not-for-profit Internet Society’s Online Trust Alliance. The 10th annual Online Trust Audit and Honor Roll analyzed more than 1,200 consumer-facing websites to determine which industry values security and privacy the most. OLYMPIA — Today, with a bipartisan vote of 31-17 in the Washington State Senate, state legislators passed a bill prohibiting “pocket service” debt collection practices, which allow debt collectors to blindside consumers with default judgments in order to seize wages, bank account funds, or other assets. Attorney General Bob Ferguson requested the legislation, House Bill 1066, sponsored by Rep. Christine Kilduff, D-University Place. The House of Representatives passed the bill with a bipartisan vote of 59-37 on Feb. 14. Pocket service allows debt collectors to send a court summons and complaint to Washingtonians before filing them with the superior court. The individual receives these documents with no case number or court date. These individuals do not realize that the 20-day deadline to respond starts when they receive the documents, regardless of whether the collection agency filed the complaint with the court. BALTIMORE, MD (April 11, 2019) – Maryland Attorney General Brian E. Frosh announced today that his Consumer Protection Division has filed charges against Cash-N-Go, Inc., Brent M. Jackson, and related businesses owned and operated by Jackson under the “Cash-N-Go” name for allegedly making unlicensed and usurious consumer loans, referred to as “title loans” or “title pawns,” which put vulnerable Maryland consumers at risk of losing their motor vehicles. After being confirmed by the Senate earlier this month, Mark Calabria officially took over Monday as the director of the Federal Housing Finance Agency, the federal agency charged with overseeing Fannie Mae, Freddie Mac, and much of the U.S. housing finance system. Calabria was sworn in Monday as director of the FHFA, replacing Comptroller of the Currency Joseph Otting, who was picked by President Donald Trump to serve as acting director of the FHFA while Calabria awaited Senate confirmation. Calabria received confirmation from the Senate two weeks ago, when the Senate voted to confirm him as FHFA director by a 52-44 margin. Now, Calabria, who previously served as Vice President Mike Pence’s chief economist, will take the reins at the FHFA. A controversial bill regulating payday and subprime loans is dead this legislative session. On the last day for bills to pass out of the Indiana House, the sponsor for Senate Bill 613—Rep. Matt Lehman, R-Berne—declined to call it for a vote. “After a long discussion, there was some determination that it still needed some additional work, and we’re just out of time,” Lehman said. The latest version of the bill would have increased allowable interest rates on traditional loans to 36 percent, plus a $150 prepaid finance charge, and created two other loan products that would have been exempt from the state’s loan-sharking rate cap of 72 percent. The installment loans that would have been created by the legislation would have been for six to 12 months and ranged from $605 to $1,500 with interest rates of up to 192 percent. The Consumer Financial Protection Bureau (CFPB) released its Winter 2019 Supervisory Highlights recently, detailing issues currently on the bureau’s radar, as well as enforcement trends credit unions should be mindful of. A recent CUNA CompBlog post delves into the report’s details. The newsletter contains lots of discussion around Unfair, Deceptive or Abusive Acts or Practices (UDAAP), most notable in auto loan servicing mortgage servicing and deposits. General Electric agreed to pay the Department of Justice a $1.5 billion penalty for alleged accounting misrepresentations stemming from the company’s now defunct subprime mortgage business WMC.